Residing in a millionaire's playground has immense cachet. It is the domain of many and on the wish-list of many more, however in one of the most exclusive streets on Noosa Sound just 10-minutes from Hastings Street, is currently the hottest opportunity for a real estate entrepreneur. Seize the moment and remember beauty IS in the eye of the beholder. Take a look around and decide whether to knock down or glam up an 80's classic on the waterfront with great bones and happy memories. From the leafy streetscape and front garden with enormous appeal, is the front entry and the big tease of the riverfront. The generous dining and living spaces have vaulted ceilings and sliding glass doors on three sides enabling natural light to permeate indoors and connect to the covered deck. The back garden stretches to the water's edge and beach which are 20m, the width of the land. 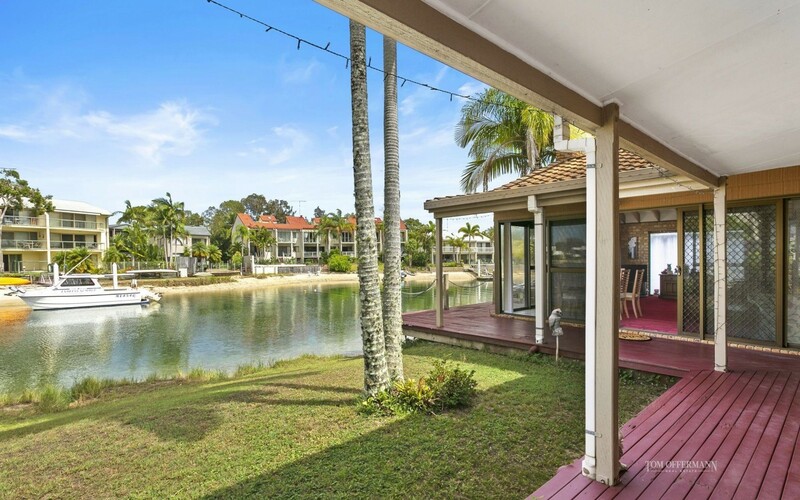 The cul-de-sac location makes it private also perfect for swimming and kayaking but of course for boaties it's easy access to the Noosa River and the Noosa Everglades. The kitchen has timber cabinetry and a courtyard. On the northern side is the master bedroom with a bay window, ensuite and robes. In the west wing are three bedrooms. Two have sliding doors out to the deck and one is currently used as a study. There's also a family-size bathroom and the laundry has direct access to the double garage. "This is a breezy, albeit faded beauty with enormous potential," comments Tom Offermann Real Estate agent Milan Markanovic. "It is surrounded by multi-million-dollar houses and will no doubt attract a lot of interest from investors and home buyers wanting to capitalise on the address. 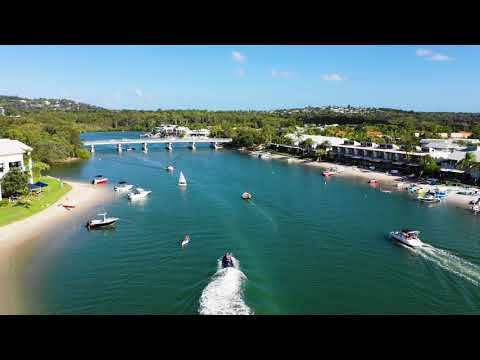 You just cannot ignore the dream location so close to Noosa's Main Beach also Quamby Place with some of Australia's best restaurants".